On this day in 1988 Wrigley Field finally joined the 20th Century. The great American ballpark that is Wrigley finally hosted a night game under the lights. Wrigley Field was opened on April 23, 1914 under the name of Weeghman Park. The ballpark underwent many changes through the years but the most important was installing lights. A total of 5,687 consecutive day games where played there before they held a night game. The Philadelphia Phillies were the Cubs opponents on this night. The game had a scheduled start time of 7:05pm. A pregame ceremony took place prior to the game in which a long time Cubs fan was able to hit a button to turn on the lights. The interesting not about this game it was never an official game. The game was halted in the fourth inning because of rain at 8:14pm. The game was officially called off at 10:25pm. 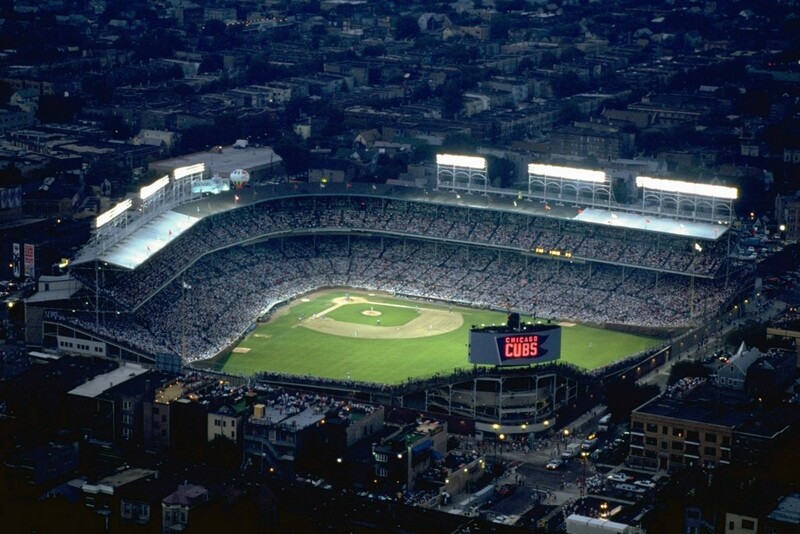 The first full game under the light would take place the following night on August 9, 1988. The Cubs defeated the New York Mets in that contest by a score of 6-4. Wrigley had a deal with the city of Chicago for many years following to only play around 20 night games a season. The reason for this was with the ballpark being located in a residential area of the city the lights would affect the local residents from sleeping at night. The long baseball season is nearing its end. The summer is coming to an end and the Fall season is about to start. With it will come the Major League Baseball Playoffs. The first games of the playoffs start next weekend. So let’s take a look at what teams are approaching the playoffs in this final week of the season. The interesting note of the week is that no A.L. teams have clinched a playoff spot yet. It has been a tight race for all of the divisional spots and especially for the two Wild Card spots. In the East there is great competition between the division leading New York Yankees and the Baltimore Orioles. The Yankees only lead that division by one game with the Rays in third place by only 5 games. The Central division has seen the Chicago White Sox fall quite a bit in the past week. The White Sox are trailing the Detroit Tigers in the division by one game. The third place team in the division is held by the Kansas City Royals who are fourteen games behind and have no hope for the playoffs. The Western division has just as tight of a race as the Eastern division. The Texas Rangers hold the top position with a record of 92-65. The Oakland A’s have been surging ahead in the final month of the season and are only three games behind the Rangers. In third place five games behind the Rangers are the Anaheim Angels. The Angels got off to a bad start at the beginning of the season but were able to turn their season around in the summer months. Only six games separate the top five teams in the Wild Card race. The Baltimore Orioles and the Oakland A’s are in the top spots. The Angels are two games back. The Rays are three games back, while the White Sox are six games back and will likely only be able to enter the playoffs with winning the Central division. The almost half of the playoff spots in the N.L. have been claimed. All but one of the divisions have champions already, which takes some of the excitement away. This is the only division where a champion has not yet been crowned. With the third place team the Phillies seventeen games back, its between only the Braves and the Nationals for the crown. The Nationals have shocked the baseball world with an incredible season and they currently hold the top spot. The braves are trailing by four games and still have a chance at winning the division. Both the Nationals and Braves have clinched playoff spots. The only question is which one will be the division champion and which one will be in the wild card position. The Cincinnati Reds won the division this past week. They appear to be a team that could contend for the World Series Title in October. The San Fransisco Giants won the division championship just a few days ago. This team has been a great team built for the playoffs for a few years now. The Giants won the World Series in 2010 and are looking to win their second in three years. With the Braves having clinched a playoff birth there is only one wild card spot remaining. The St Louis Cardinals hold the remaining spot at the moment. The Dodgers and the Brewers are the only two teams that still have a chance for the remaining wild card. The Dodgers are three games back while the Brewers are five back. The Dodgers have been turning downward as September rolls along. The Brewers have to win their remaining five games to have a chance. The Cardinals will likely hold their position and go into a wild card playoff game with the Braves. The Miami Marlins are having a disappointing season, so much so that no one saw this coming. The team headed into the 2012 season with so much hope and excitement for what could be. They have dismantled the team to the point it hardly resembles the team that was supposed to make the playoffs when the year began. As of Saturday the team sits 14.5 games behind the 1st place Washington Nationals and a Wildcard birth looks very unlikely. 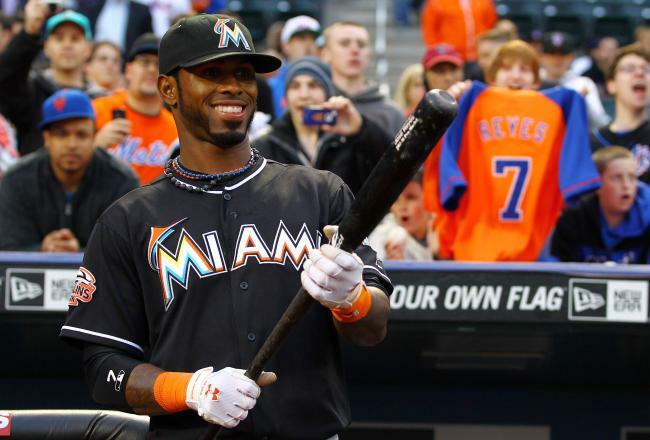 The only bright spot that can be seen at the point is Jose Reyes and his hot hitting streak. Jose Reyes began this hitting streak on July 13th and is holding strong at 22 games going into Saturday’s game against the Nationals. Reyes went 1-3 in the first game of Friday’s double header with the Nationals and 3-5 in the second game. Reyes has always been a great hitter but has really improved his hitting and it shows with this current streak. He broke his previous streak of 19 games this past week. Luis Castillo holds the team record for most consecutive games with a hit with 35 games in 2002. That is a mark that Reyes has a strong chance of beating. The have been 55 players in the history of Major League Baseball to have at least 30 consecutive games with a hit. Reyes is the caliber of hitter and streaky enough to become number 56. The question the will be asked if he can make it past 30 will be how far can he go? Everyone knows that Joe DiMaggio holds the record at 56 games in 1941 and that mark is very unlikely to be broken soon if ever. The closest anyone has come in the last 20 years was the Phillies Jimmy Rollins in the 2005 and 2006 seasons with 38 games. If anyone was going to make a good run and come close to DiMaggio in this era of baseball it would be Joe Reyes. Reyes is still very young and has a lot of potential as a hitter even though he is already one of the best in baseball. Reyes is the defending National League batting champion and this will not be his last claim to that title. As this season grows older and the Marlins fall deeper in the standings the Marlins might have something to get excited about. That rests solely in the hands of Jose Reyes and his bat. Could we be watching history right now? It is too early to tell but we are seeing an amazing streak and its time for the sports world to pay attention to Reyes. If they don’t start now they may be missing history in the making. Highly touted Washington Nationals prospect Bryce Harper was called up to the big league ball club on April 28th. He was drafted 1st overall in the 2010 June MLB draft. Harper has had a lot of hype and promise around him ever since he was featured in a 2009 edition of Sports Illustrated magazine. He has been called a future legend by many in the sports media. Harper has also been called immature and egotistical during his 2011 Minor League run. Now we get to see how the 19 year old phenom develops into what could be an incredible baseball player. Bryce Harper Has been at the Major League level for a month now. So I figured it is time to take a look at the numbers and see how he has done. The stats mentioned are compiled from his first 31 games at the big league level and took place between the 28th of April and the 2nd of June. Harper has had 115 appearances at the plate. From those at bats he has 32 hits, 16 base on balls and has been struck out 21 times. His batting average is at .278, at the plate he has fared pretty well for a player that just got to the show. He has shown some power amassing 10 extra base hits and knocking 4 ball out of the park. He has produced a good number of runs with 21, Harper has also 11 RBI’s. His debut came on the 28th of April in Los Angeles when his National faced off against the Dodgers. Harper went 1 for 3 that night, the hit was for a double and he also batted in a run. The Dodgers won that game by a score of 4-3. Harper’s best game at the plate came on May 2nd against the Arizona Diamondbacks at home. Harper went 3 for 4 with 2 doubles, 2 runs and 1 RBI. He has been a really good part of the Nationals offensive production. He has also been an asset to the club in the field. Harper was brought up through his amateur playing years as a catcher but once drafted was converted to an outfielder. Harper currently occupies the Right Field and has a rocket arm and really good fielding. The most publicized event for Harper came May 6th when the Nationals played the Philadelphia Phillies. The Phillies star pitcher Cole Hamels nailed Harper in the back with a pitch. It looked intentional but Hamels left no doubt that it was on purpose when he admitted it after the game. Harper handled the situation with all of the maturity in the world and shrugged it off. When Harper was asked about it later he just said that they were both competitive players and sometimes that happens. This last month of watching Bryce Harper play has shown us a few things. He was indeed ready to be called up from the minor leagues. He has been the player the Nationals need to continue to compete in the tough N.L. East. He has played well on both the offensive and defensive side. Most importantly he has shown that he can be as humble as he needs to be right now to develop and improve. I believe Harper is going to continue to get better and in a couple of years could in fact be one of the best baseball players around. 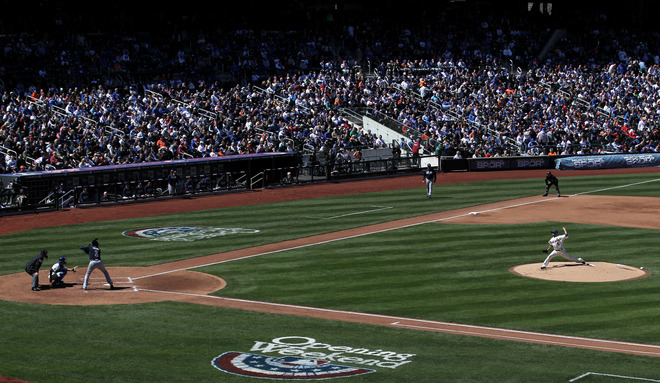 Johan Santana throws out the first pitch on Opening day for the Mets in New York. Baseball is back and the first weekend is complete. It was an exciting and surprising weekend for many teams. If you missed any of the action here are some of the highlights and low lights. For the first time since 1966 both the Yankees and Red Sox started off the season 0-3. The Yankees were swept by the Rays in Tampa, beating them 3-0 on Sunday. No need to fear Yankees fans. The last time the Yankees started 0-3 was 1998, and they ended up winning 114 games and the World Series title. The Red Sox lost an extra inning game on Sunday 13-12 to complete the sweep by the Detroit Tigers. The Tigers proved to be as powerful as everyone thought going into the season. Point proven when Prince Fielder and Miguel Cabrera both homered in the 10-0 during Saturday’s gave versus the Red Sox. The Tigers scored a combined 26 runs during their first three games. I expect both teams to bounce back from their sweeps this week. 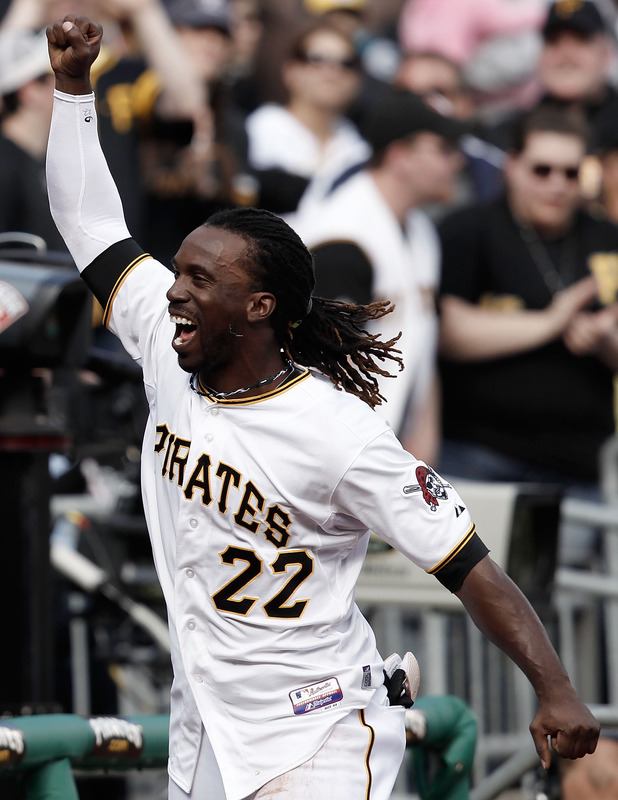 The Pirates Andrew McCutchen celebrating on Sunday after a walk off RBI single against the Phillies. Another shocking thing came from this first weekend, The Pirates took two out of three from the Phillies. Both of the victories were of the walk-off type. The first happened on Saturday in extra innings when Rod Barajas drove in Alex Presley for the 2-1 victory. The second came on Sunday after the Pirates tied the score at 4-4. Andrew McCutchen drove in the winning run lifting the Pirates over the Phillies by a score of 5-4. The Pirates could be interesting to watch if you base any value on this first weekend. The “new” every thing Marlins began the season with a surprising 1-3 start. They started their first two games with no offense and loses to the Cardinals and the Reds. The first lose was to the Cardinals in their brand new ballpark in a 4-1 effort. On Saturday in their third game the offensive power showed up in a 8-3 victory over the Reds, the fish had three home runs in that game. Sunday brought their third lose of the season when the Reds rallied in the bottom of the ninth. Scott Rolen came in as the pinch hitter and drove home the winning run to give the Reds the 6-5 victory over the Marlins. It will be interesting to see how the Marlins play in Philadelphia this week against what many consider to be the best rotation in the league. Opening Day history was made on Thursday when the Blue Jays went to the 16th inning with the Indians. J.P. Arencibia hit the game winning three run homer to put the Blue Jays on top of the Indians 7-4 in that game. The game broke the previous opening day record of 15 innings held by the Tigers and Indians from 1960 and another 15th inning game between Philadelphia and Washington in 1926. There is something really special about seeing records broken that have stood for so long. Albert Pujols went 0-3 in his debut for the Angels in their 5-0 victory over the Royals on opening day. The Royals ended up taking 2 out 3 games from the Angels this weekend. Pujols has a .143 batting average to show for his first weekend with his new team. The Angels have to be surprised how this first series ended with Pujols slumping. I have no doubt he will continue to be the most feared slugger in the game though. The A's Yoenis Cespedes going long. There is an emerging star in Oakland. 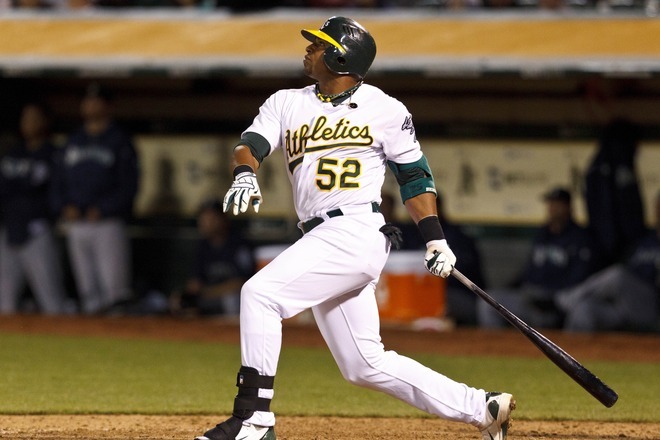 The high paid Cuban Yoenis Cespedes, has played incredibly during his first series in the Major Leagues. He is batting .308 with 3 home runs, 7 RBI’s and 3 runs. He goes against everything “Moneyball” GM Billy Beane has been able to do in the past with little money allowed to him for the A’s. This year he was able to get big money for this highly touted free agent. It appears that Cespedes will be worth the money spent if he keeps producing like he the past four games. The Mets played better than expected by sweeping the Braves in three games. Its is the first time the braves have started the season 0-3 since 2003. The Mets were expected to occupy the cellar in the N.L. East and still very well could, but they are looking pretty good coming out of the first weekend. The Mariners Brandon League celebrates after getting the save against the A's on Saturday. Oh yeah, there was good pitching also. Kyle Lohse had a solid 7.1 inning game against the Marlins on Wednesday and picked up the win. The Nationals Stephen Strasburg had a great 7 inning game with 5 k’s in Thursdays victory over the Cubs, although he did not get the win. The Mets Jonathon Niese had a no hitter going into the 7th inning against the Braves on Sunday. The no-no was ended though, it would have been the first no hitter in the Mets 51 season history. The Mariners Brandon League picked up 2 saves this weekend. League could end up being one of the best closers in the A.L. 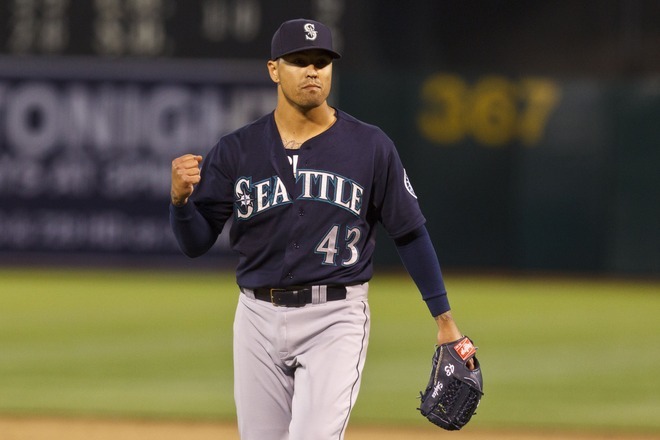 if the M’s can continue to produced solid games for him to finish. Other than Niese’s possible no hitter there were no amazing moments by any pitcher, just a lot of solid pitching throughout both of the leagues. Some experts are calling this season “The Year Of The Pitcher III”, but I think we will have to wait and see about that. If you take a look at the standings right now there are 5 teams that started the season 3-0. Those teams are Orioles, Rays, Tigers, Mets and D Backs. The season is very long though and as we all know a lot of teams fall off by July. So no one should get too excited or upset at this point. This first weekend has been very exciting and if its any indication of what is to come I think it will be a great year for the fans.